I found a ball or woven mollinia grass on a heathland path, I knew it to be the nest of one of Europe’s smallest rodents, the harvest mouse. I gathered it up and noticed that it was rather heavy although soaking wet with recent heavy rain. 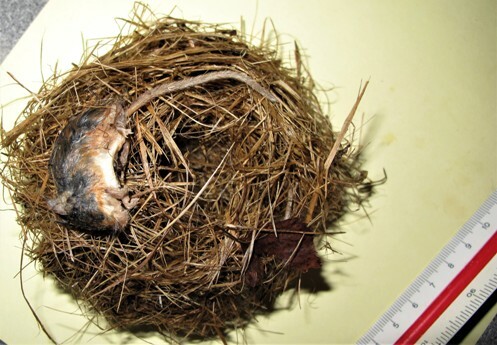 On squeezing it gently I felt a small lump inside so opened it up to find a baby harvest mouse, dead and a few days decomposing. I wondered who had placed it in the path away from the grass clumps. It didn’t seem to have any damage on the nest or the mouse, maybe strong winds had simply blown it away and most of the baby mice and parent may have fled leaving one weak individual behind! 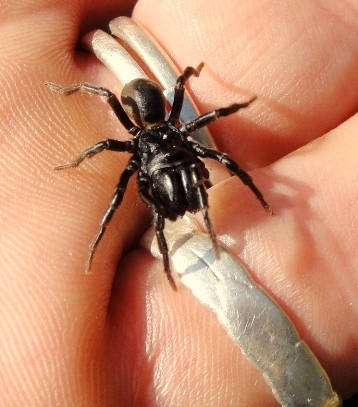 the only mygalamorph spider to live in Northern areas like the Arctic circle is Atypus . 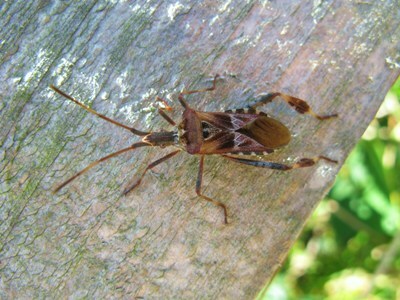 We have A. affinis in the UK. It is common on our southern Heathland at least and can be seen wondering around looking for females in case of the male, which does this at any time of the year.I found this one late November, but the females I have only found in the springtime also searching for males.It is a primitive species and like the bird eating tarantula s(wrongly named)is slow and long lived.The male has huge chelicerae. 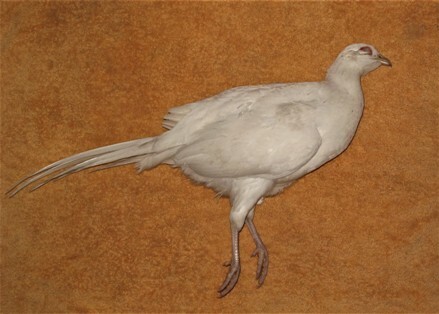 I have only a few times seen fully white pheasants. I found a lovely white female a short while ago, totally white except four brown nape of the neck feathers.She had purple- blue eyes! 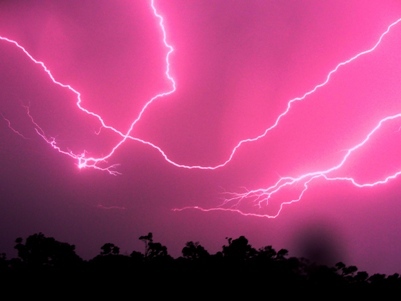 not pink. This winter we have had snow, very unusually and lots of it. it is of course a good time to get out and track wild animals. 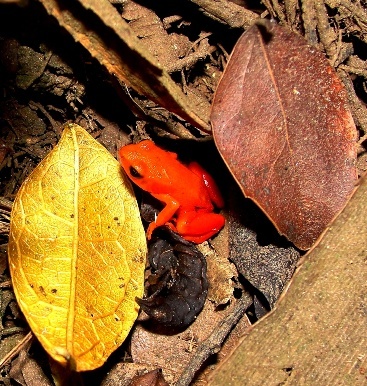 One of the most surprising aspects of this field work is to find the evidence of animal of which were not thought or believed to exist in certain areas. Many naturalists fail to do the field work and if they did, then they would also find evidence of exceptional importance. 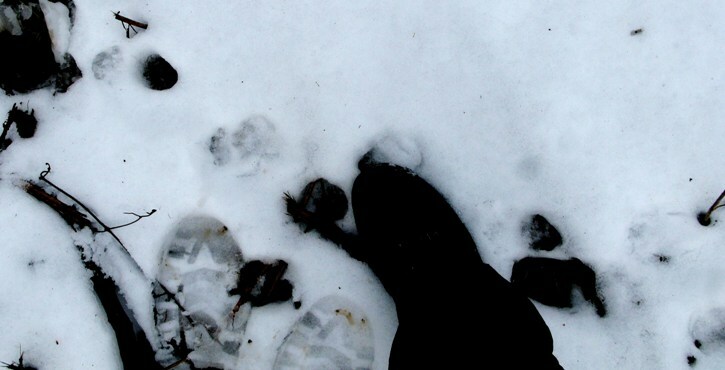 In this photo, one can see the footprints of several mammal species.There is polecat, pine martin, badger, fallow deer,fox and brown hare. These prints were found in cranborne chase in Dorset. 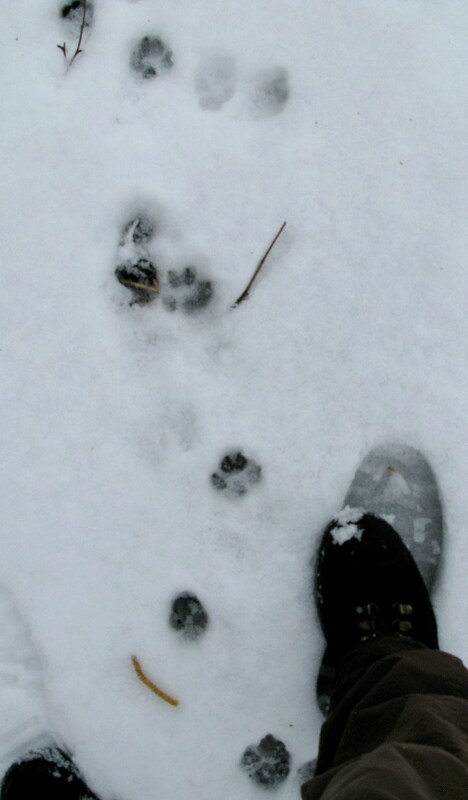 These are the footprints of a wildcat, no not in Scotland but here in the south of England in Dorset. wildcats have always survived here, despite the constant belief that they have not done for about a hunderd years or more. I have found a road killed specimen of a eight week old kitten that was as large as a small house cat and its teeth had not yet erupted through its jaw. this kitten was larger than a hen pheasant( see previous posts for photos) in big cat section.the footprints of the Eurasian wildcat are slightly different from those of the domestic cat by being more lynx like, and larger. 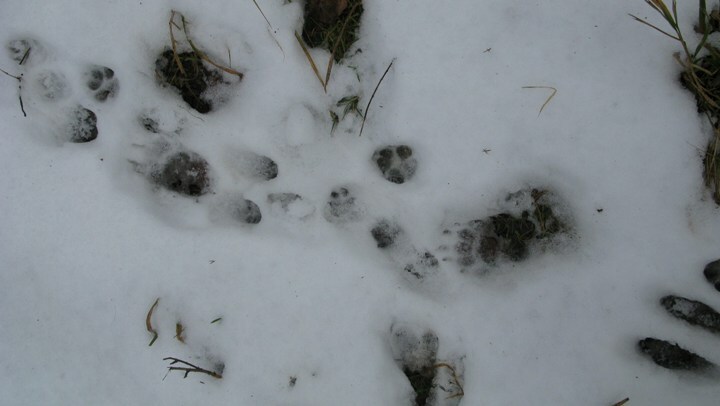 These were six cm in length and followed a hare across woodland and open field.the print above the first cat print by my feet, is that of a fox. this is a print of a leopard as it leaped over a bank and barbed wire fence, clearing six feet of snow. this is typical pine martin prints. Often especially in the North of England or Scotland the martin grows thick fur between its toes and usually the pads are not so clear. down south, we rarely get snow so the martin has lost this evolutionary trait to deal with cold and snow, thus the toe pads are more clear. 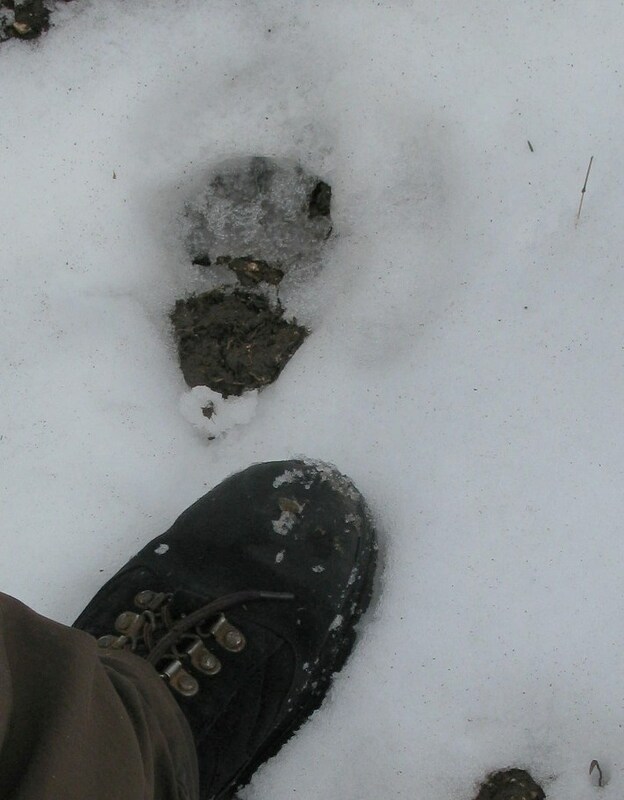 I found the prints of two individuals at the same place suggesting that a female was followed by a male; it was their breeding time in February. Local people who live around Bournemouth ,Christchurch and Ringwood areas will no doubt be aware of the new surface to the A338 Bournemouth spur road to Ashley heath roundabout. It has been recently re-surfaced ,widened in some areas and has been dubbed as the greenest road in the south ! I beg to differ. the road is far from environmentally friendly, and in fact is just the opposite.The road now has a concrete barrier within the central reservation for the whole of its length, when before there were steel rails that did an adequate job of preventing runaway vehicles from entering opposite lanes. Now, wild animals cannot cross the road for almost the whole of its length. 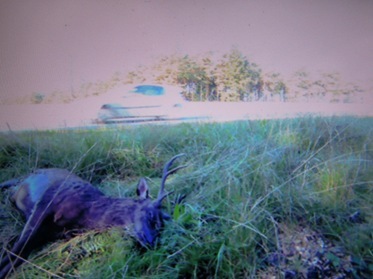 In fact the road has become a death trap to all wild animals and has posed an even greater threat to motorists as deer try to jump the wall, people in vehicles cannot see what is coming over the wall and so plough into anything causing huge damage to themselves, their vehicles and off course other road users. What gets me is the fact that in the Bournemouth echo, the road was dubbed the greenest and most environmentally friendly road to be rebuilt! how and why can this be? The road is a disgrace where the wall comes in. All wild animals need and have to roam freely to be healthy and spread their genes. Too many barriers such as main roads, railways, and fences are so detrimental to the welfare of wildlife. The whole of the UK is covered in railway lines and dual carriageways causing much distress to mammals. It is bad enough building more roads and railway links and if the HS2 happens then that will be absolutely atrocious. We cannot keep doing this just because of the fact that humans breed like rats and need more and more of everything. When will it stop ? Since the new road has been overhauled, I have seen foxes,badgers,polecats,muntjack,sika,roe,fallow,otters and other animals dead at the centre of the road, been unable to cross to the other side. There are three main areas where mammals cross this long section of road and none of them were earmarked for tunnels ! why not? i would like to know who was on the planning board . It seems yet again that Bournemouth borough council has not given a dam,n for wildlife and conservation which of course ids normal. They have a very bad reputation regarding this issue. 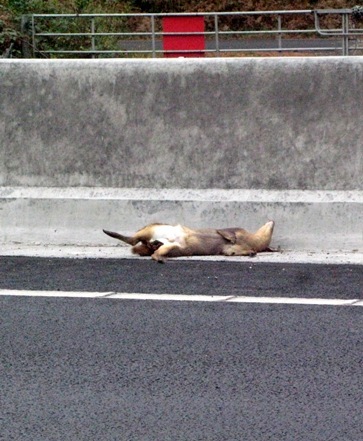 In the photos, muntjack and sika deer lie dead at the roadside when they may have made it across if the concrete barrier was not there. 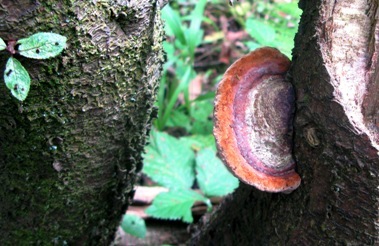 This maybe a splendid year for fungi, as long as we have plenty of rain. There are interesting varieties already fruiting. This bracket has yet to be identified. 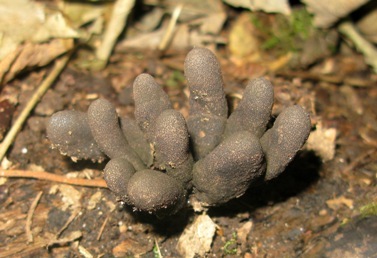 These are dead men fingers. 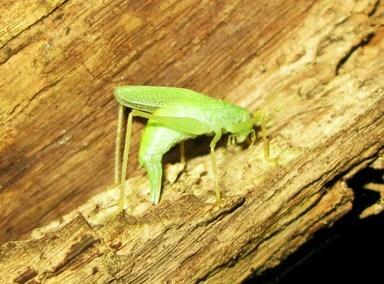 The oak bush cricket lays her eggs, to overwinter before hatching in the springtime. 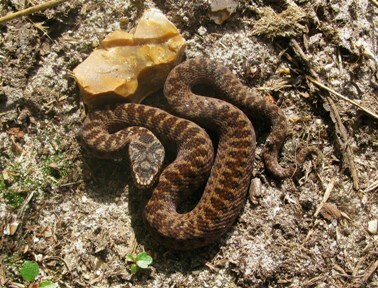 A very handsome young male adder has recently fed, possibly on a small lizard. females of the species are usually brick red when they are this small.The males turn lighter as they grow, the females retaining the brown. 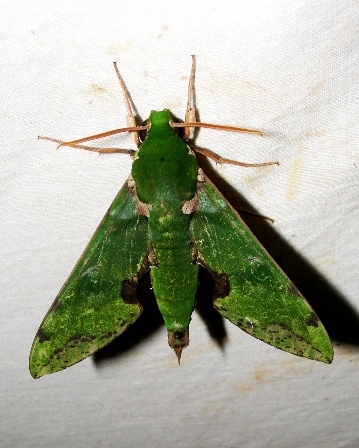 This specimen was only nine centimetres long. As usual I am very worried regarding the future of our lowland heaths. There are meant to be stringent laws and regulations regarding the protection of these rare habitats and one would have thought that over the last few decades of heathland protection, that conservationists would know the difference between right and wrong management practices. However, this is obviously wrong.One of our best tracks of lowland heath within Dorset is Arne heath nature reserve run by the R.S.P.B. When i was a young boy, I was out with the conservation volunteers clearing scrub especially encroaching pine trees, by pulling them up in their thousands every winter. since the nineteen eighties, this practice was not used so much as the heaths were grazed by deer, sika deer which do a grand job naturally manicuring the heather,gorse and eating the seedling pines. The R.S.P.B along with other conservation bodies have waged war on sika deer and near on eliminated them from the reserve and many other parts of Purbeck heathland.This is an Eco disaster. Without these beneficial animals doing this, Arne has sprouted thousands of small pines all over the area and the young trees are about three to four years old, which would suggest that teams of people have not been pulling them for this length of time.The heath is becoming overgrown. 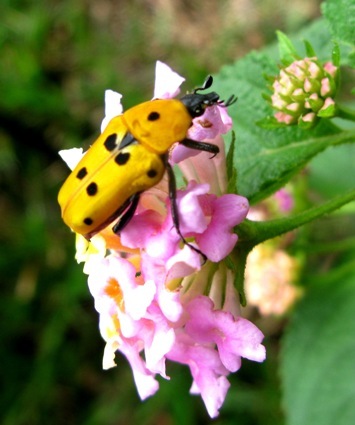 Also with no deer, there is no dung for the many species of beetles and fly to use, some use the dung of cattle but it is the larger beetles and flies that need the deer pellets, and these beetles feed the birds and reptiles. Deer do not destroy reptile sites like heavy cattle do and do not over graze as some of the staff have stated. When local visitors ask where have all the deer gone, they are told that they were starving and overgrazing the area. this is of course very wrong. How much longer are we going to be told lies by the R.S.P.B staff? Many good naturalists are very worried about this situation. All the green bits, are small pine trees. There are no deer here to graze them out. 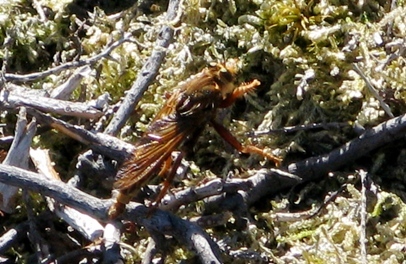 This rare fly(Asilius crabroniformis)(hornet robber fly) can be still found on the heath but is becoming scarcer as the deer are taken out. I do hope that modern conservation bodies realize their mistake, but as usual with humanity, we only know what we have lost after it has gone and by then it is too late. The deer may have needed to be finned out a bit, but not near on eliminated. 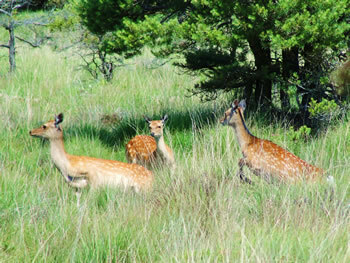 Sika deer are so similar to red deer and do the same job .In the past, there were herd grazing this very heath before the nineteen fifties, so nobody can claim that they are a none native invasive species in the same way as a few other species, and besides they have natural predators. Pumas and leopards have been eating them for decades and have used Purbeck as one of the main healthy breeding areas simply because of its bio diversity and especially because of the large amounts of deer were enough to sustain them. now there is not enough along with poaching and road kill, let alone the eradication(see my big cat blog) programme.There may be more domestic stock taken, more birds, and dogs taken because of this. The Japanese sika deer (Cervus japonicus) has been a welcome addition to British wildlife and adds that special completeness in the wake of the red deer going.The species brings many visitors and naturalists to Purbeck especially during the rutting season after September to November. A small herd of sika hinds that are clearly not overgrazing the heaths. house sparrows are on On another note, some good nthe increase due to some local councils not cutting roadside verges. Grass needs to flower and seed to feed finches. 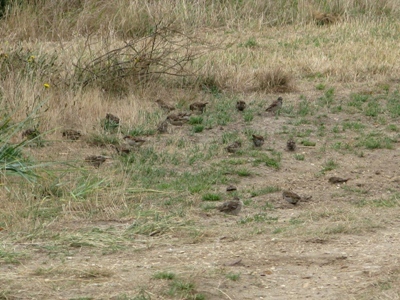 Sparrows depend on this for their survival and in recent times this species has had to adapt. 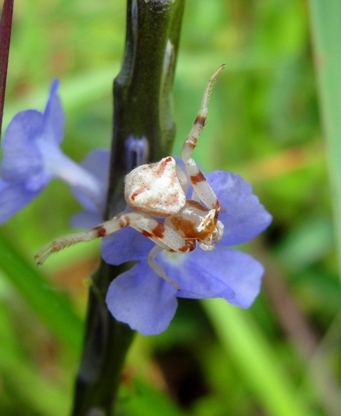 Many sparrows feed mainly on spiders around the houses, but on the Bournemouth cliff tops, this year the council have not cut the grass (thank goodness) which means a whole variety of species benefit. These sparrows are eating the seeds of grass, tree lupin and sea beats. As long as long grass is available then this flock will survive. 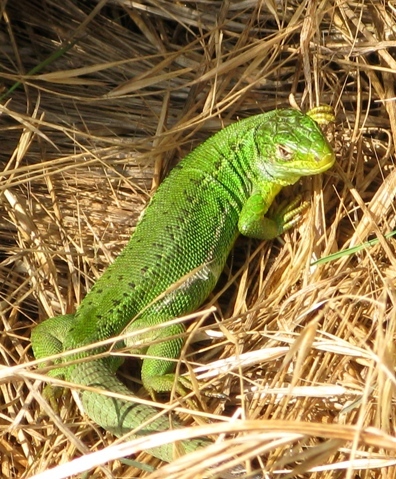 The western green lizard(Lacerta Biliniata) has returned from a near absence with several adults being seen. Over collection and bad weather for the last three years saw their numbers crash. There are now only approx a third of the numbers there were six years ago.This species has no legal protection in this country as it is thought to be a none native, which really is not true. 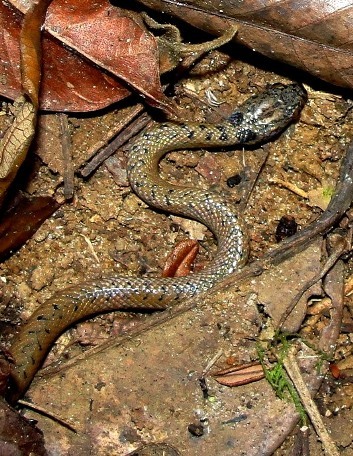 reptiles naturally colonise by several different means and regardless of this status they should still be protected in the UK as in Europe. 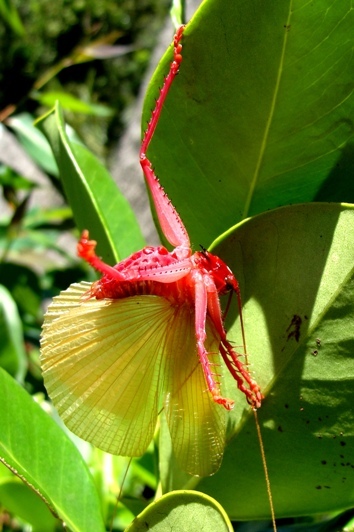 We need this species here and they do not out compete with other native species as they evolved alongside them. 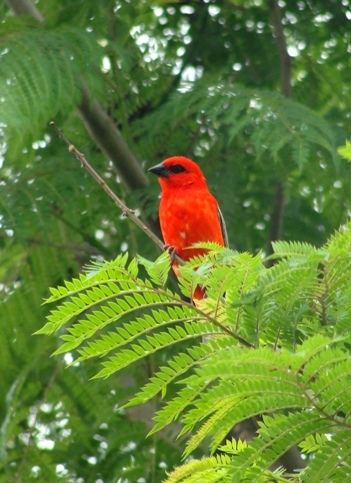 We have to consider global warming and the natural movement of species. 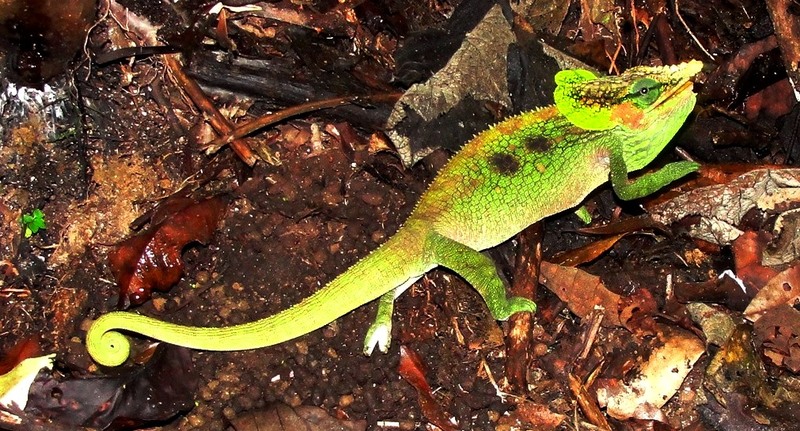 A mature male green lizard basks after rain. 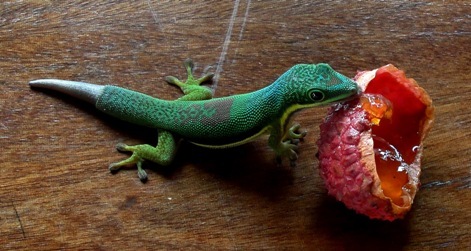 A female mature green lizard basks. I hope her eggs hatch to create a new generation. This species must survive, even if they are not natural colonies. 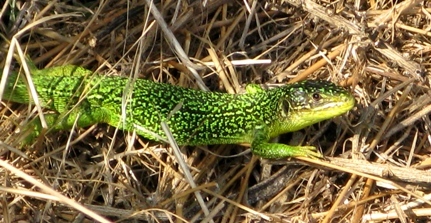 There are no sand lizards (Lacerta agilis) within the areas where the green lizard lives, so they do not pose a problem , and nearby colonies of the former are not in good health anyway as they are inbred, and most of them live on the open heaths rather than the small strip of coastal cliff. 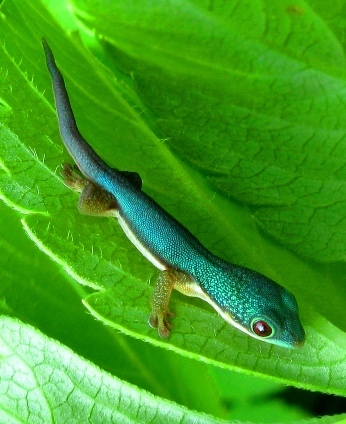 It is best to allow in the wake of global warming as in the future the area may be too warm for common lizards and even perhaps the sand lizard. 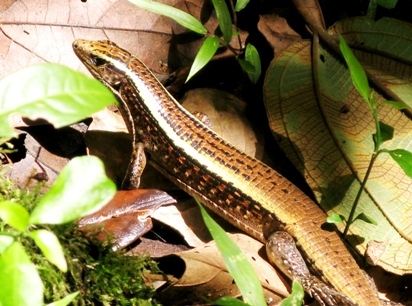 This species, along with the common wall lizard(Podarcis muralis) can be the adapting species needed to fill the gap. 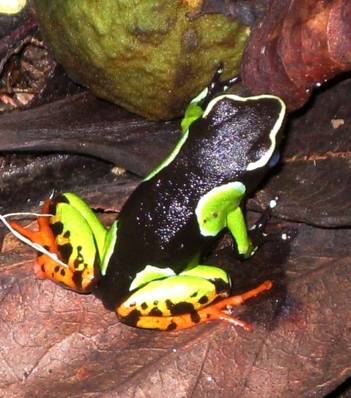 Posted in Uncategorized	| Comments Off on The failing conservation bodies. 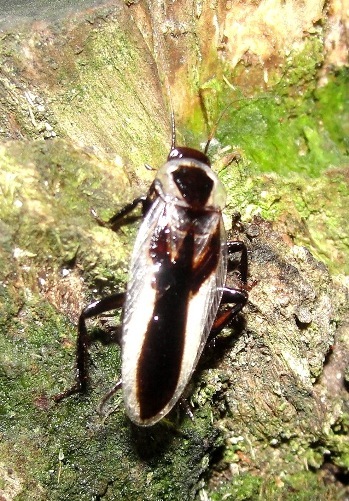 Many species of cockroaches abound, most of them native but many none natives also. 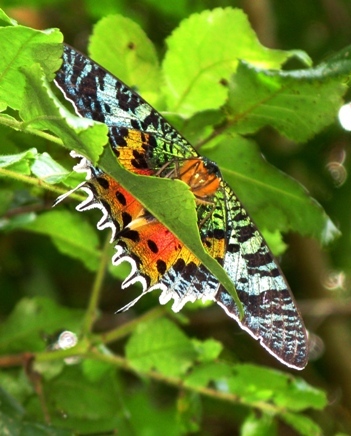 some are very colourful. 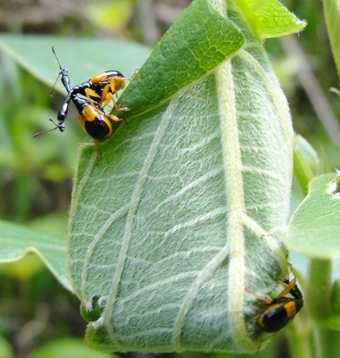 Yellow and black giraffe weevils. 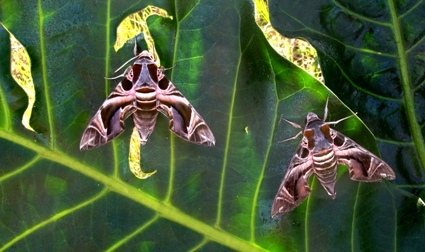 Two males sparing, a female roles the leaf ready for egg laying.There have been found at least seven species of leaf roller weevils, most of them having long necks like the typical red giraffe weevil. I found six species. 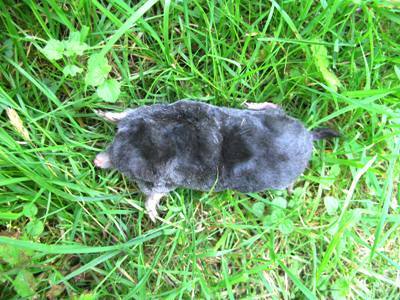 The common mole can be found dead along paths and roadsides now as young animals leave their parent. They are very vulnerable especially males as they are chucked out of the underground nests more abruptly and are forced to cover greater distance as they are so territorial. It is more often males that I find on paths having been trodden on by people who dont even see them, or by deer and horses. Most moles are this colour but with slight variations in shade, but I recently had a report of a blonde mole alongside a normal coloured sibling. I have yet to find an odd coloured mole but there are many reports of pi-bold animals, blonde,yellow, greenish,or white , even jet black. 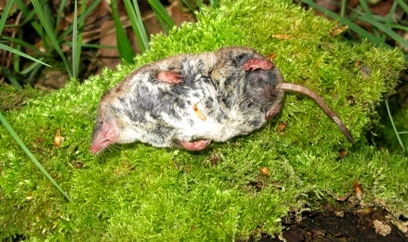 The common shrew can also be found dead and maybe more often than alive, as it is so fast and furious when under cover, it is hard to see them. the high pitched squeaks that they emit are rarely heard by ageing adults. 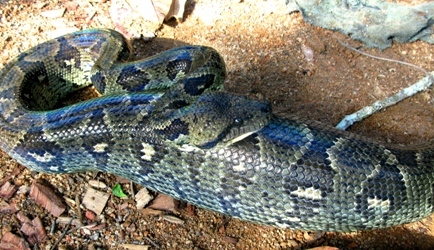 they too are very vulnerable on paths and roads. they also seem to drop dead whilst doing their stuff, as their bodies cannot cope with stress or hunger and they keel over wherever they are. I find many common shrews in paths , sometimes pygmy shrews.Moles and shrews, along with hedgehogs and bats are all insectivores. 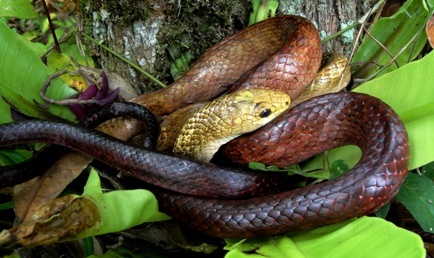 they are not related to rodents which are usually vegetarian or omnivorous, but only eat invertebrates, usually worms,slugs and snails. moles eat more earthworms than anything else but shrews over power anything smaller than themselves including other vertebrates such as small mice,reptiles and amphibians. Fox cubs also are leaving their parents at this time and they are very vulnerable to road traffic. I should imagine that two thirds of all fox cubs die within the first year. This cub was carrying a road killed rabbit when it was struck down. People talk so much rubbish about foxes, as well as other carnivores such as badgers.One very nasty lady has just in the past few days accused badgers of killing many lambs and stripping the carcasses leaving only skull and spine! well that seems more like big cat feeding to be honest. Badgers do not eat lambs or adult sheep but they eat worms and bluebell bulbs! hardly a carnivore !yet all these badger haters keep mouthing off lies about hem. They do not even spread bovine tb. All the hype about this subject is very wrong, immoral and must be stopped. Foxes cannot over populate as most carnivores are self sustaining. Foxes only eat what is available to them, which is usually human waste in the form of food. 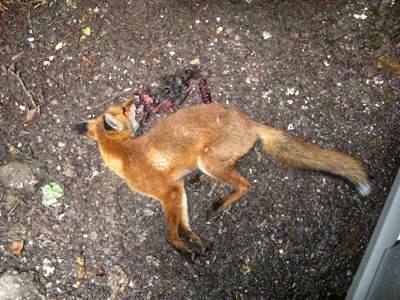 without foxes,rats,mice and pigeons we would be knee deep in our own rubbish. without all these animals clearing up after us we would also get more disease so lets be grateful for these cleaner-uppers! 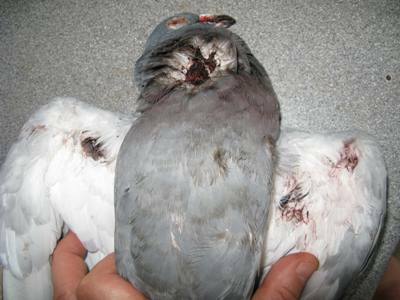 This pigeon was killed by a fledgling peregrine falcon. I have noticed this a lot between July and august when the falcons are learning to hunt they often make mistakes, or hit birds but cannot retrieve them as they are in the middle of town with cars and people. Falcons must be encouraged in all towns to keep down the feral pigeon populations and not be ridiculed by silly people who dont like seeing bits of birds under their nest sites.We must all learn to live with wild animals regardless, and be educated about them. We are always to blame. 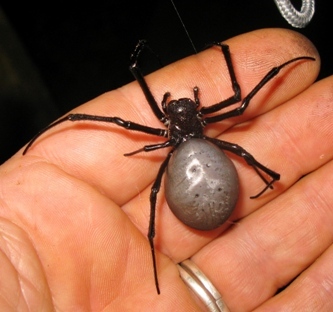 The suborder of spiders known as mygalomorphae, comprise the so called tarantula spiders;a misnomer as there is only one true tarantula spider and it is a small member of the Alopecosa(tarentula), of which are several similar species. One of which was renown for biting people working in the field in Switzerland and Italy. 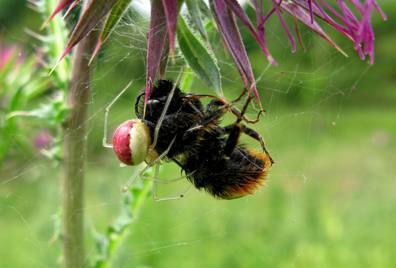 If bitten by these small spiders people would traditionally dance the tarantella which sweated out the venom. 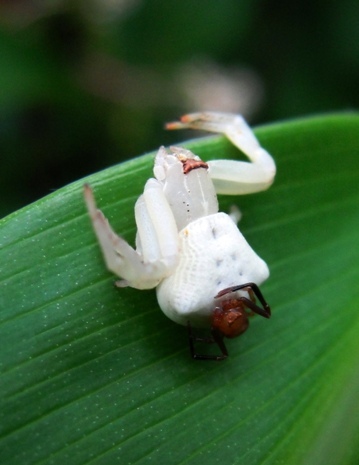 The spider became a legend and after some people thought that the large bird eating spiders of tropical places must be this dangerous spider. well the so called bird eating spiders are not that dangerous and for their large size are some of the least venomous of all spiders. 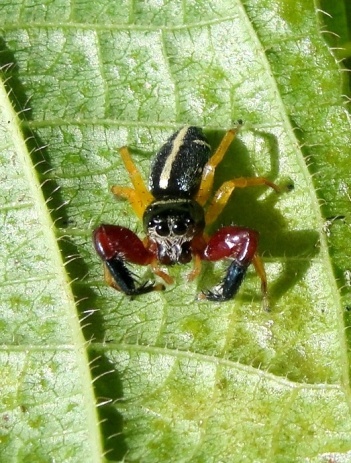 Mygalamorphs are actually primitive spiders in that they retain certain traits of other arachnids such as scorpions and harvesters by having two simple eyes and forward moving jaws(chelicerae),and two pairs of book lungs instead of one pair in more modern species. In northern Europe there are three representatives of this group.They belong to the genus of Atypus. 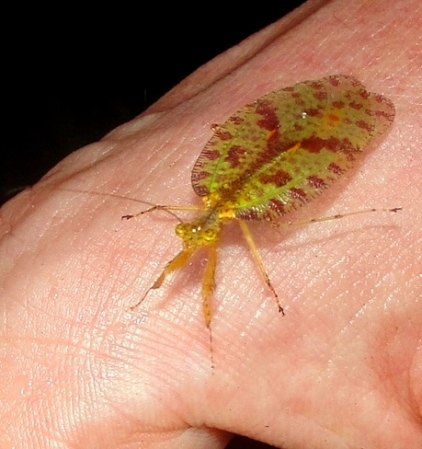 Atypus affinis lives in Britain. This is a male. 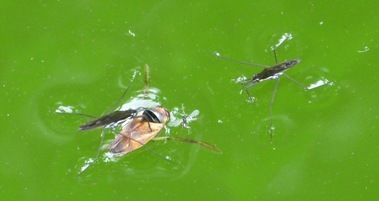 The females are much larger especially the older specimens. they could possibly live for up to ten or exceptionally, twenty years of age, similar to most other members of the family. 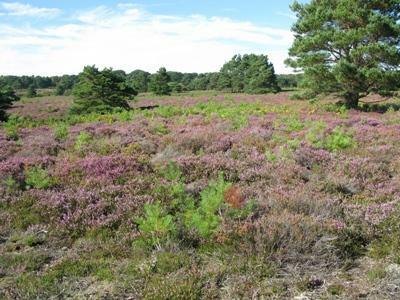 They are common on chalk downlands, or in this case lowland heath.Colonies can be very large. 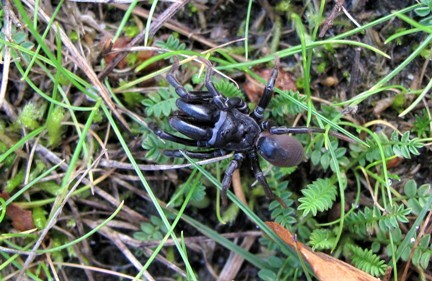 They are funnel web spiders and live in a long tube lined with special silk just below the ground surface, often around ant mounds. The Roe deer (Capreolus capreolus) has just finished rutting. The smallest native deer species to the UK, the roe has differing behaviour and rutting times than the larger species which rut between September and November, and grow antlers during the summer months. 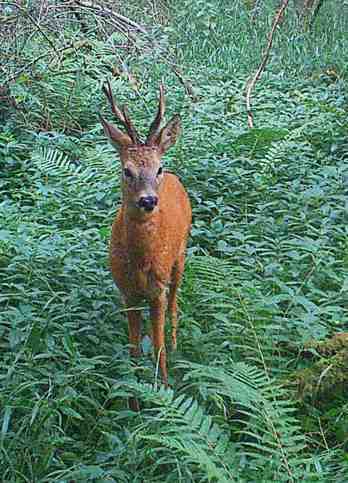 The roe grows antlers during the winter months, from November to May.The bucks rut at the end of July or august and are triggered mainly by hot weather and lessoning daylight.Hormones kick in and the bucks behaviour changes.He becomes stuck to a territory where he chases away any young buck. these youngsters often have to run the gauntlet of many mature stags before they find a vacant area of woodland to call their own.It is then that many young roe bucks perish on roads,rivers and other obstacles. The mature bucks stand their ground and it is the time when one can get pretty close to them without them panicking as they usually would. 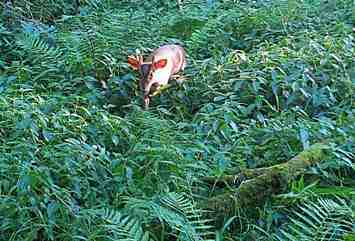 The much smaller muntjack deer ( Muniacus reevesi) is native to china and has established itself over most of southern and central England over the last century after escaping from private collections. the size different is apparent ,but many people do not know which is which and often ask how to distinguish between the two. the roe is much larger in body and has longer legs and neck with dark and white around the muzzle with tiny, often unnoticeable un-branched antlers which are just spikes with some smaller pseudo tines at the base. The deer rarely venture into open areas during the day and are most likely to be in thick cover. 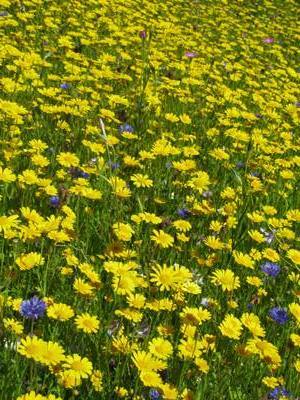 In some areas where they are common i have noticed that they do not do as much damage as some people claim and large numbers can live in suitable habitat without destroying the wild flower under-story. There is much misunderstanding of this species and all other native or none native deer in the UK and over the last decade, war has been waged between farmers and conservationists to a silly extent, based on proper-gander and ignorance. Deer are hardly the pests some folk make out and to be honest we need them to keep a healthy balance within the ecosystem. we need their browsing and grazing, we need their droppings in the ground and we need them to be food for many other mammal and bird species. There has been a huge surge in deer numbers throughout Britain over the last twenty years, but now things are balancing out mainly due to predation from natural predators.The native and none native species of cats are helping to keep their numbers in check and keep them healthy. Whoever says that deer have no predators in Britain are very wrong and are fuelling the mass Eco-fascism.